Paris (AFP) – Seven Somali pirates were sentenced to between six and 15 years in prison by a French court for the hijacking of a French yacht and killing of its owner in the Gulf of Aden in 2011. Christian and Evelyne Colombo were on a round-the-world trip when their “Tribal Kat” catamaran was hijacked by pirates in the Arabian Sea. Christian was killed and his body dumped in the water, while his wife was held hostage for 48 hours before being rescued by the Spanish military. Two members of the gang identified as the “recruiters”, Farhan Abdisalamn Hassan and Ahmed Abdullahi Akid, were handed 15-year sentences. Farhan Mohamoud Abchir, a minor at the time of the hijacking who has developed schizophrenia while in prison, according to his lawyer, was given the lightest six-year jail term. The prosecutor had sought terms of up to 22 years for the seven. “It’s hard to understand the range of the penalties, the motivations of the court. Fifteen years is a very heavy sentence,” said Augustin d’Ollone, lawyer for Akid Abdullahi. The Colombo family cried as the sentence was read out. “It has been four years that we have sought life sentences. This verdict does not satisfy us,” the family said in a statement posted on social media. Before the sentence was read out, the Somalis asked for “forgiveness” for a crime they said haunted them “every day”. The Colombos had sold everything before embarking on a dream round-the-world trip. They left the Yemen port of Aden in early September 2011 and were heading for Oman — a journey that took them through notoriously pirate-infested waters — when naval authorities received a distress signal from their “Tribal Kat” catamaran. A German frigate found the boat several hours later. There were bullet holes in the deck and a pair of glasses lying in a pool of blood. No one was onboard. Two days later, a Spanish warship located the skiff believed to belong to the pirates. They tried to approach but turned away when the attackers dragged Evelyne Colombo into view, a gun to her head. The Spanish military prepared a raid and attacked a few hours later, leaving two pirates dead and the remaining seven under arrest. She had spent a nightmarish 48 hours with the pirates, kept under a tarpaulin, drenched by waves and in constant fear of death. The defence team sought to present the seven Somalis as unwilling criminals forced into piracy by the hardships of life in Somalia. 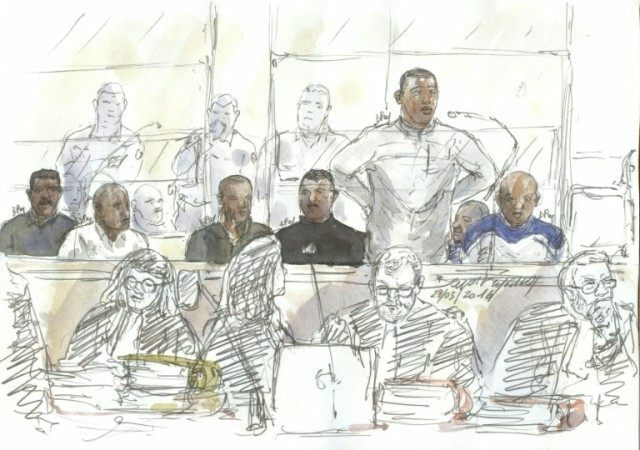 “War… hunger… for these men to be properly judged, the court must understand the hell from which they have come,” one of their lawyers, Martin Reynaud, previously told AFP, saying this could only explain rather than excuse their actions.